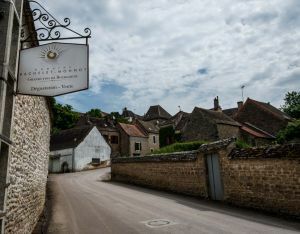 Everyone is on the lookout for Burgundy’s next white-wine star (i.e., the new Pierre-Yves Colin-Morey), and brothers Marc and Alexandre Bachelet, who created this property in 2005 from their father’s and uncle’s land, are quietly making a solid claim. In 2005 Marc and Alex Bachelet formed Domaine Bachelet-Monnot with the aid of their Uncle Monnot and father. Given the combination of exceptional vineyards, an excellent vintage, and the brothers’ attention to detail in the vines and in the cellar, the first release of the domain’s Puligny wines garnered immediate recognition, locally as well as internationally. In the conservative world of Burgundy’s top communes, such rapid rise to prominence is as rare as it is telling. The brothers do the Côte de Beaune’s rising generation proud. The domain farms just over twenty hectares (50 acres) of vines. It is a mix of family-owned vineyards and long-term leased vineyards. Marc and Alex’s grandfather was a vigneron and created Domaine Bernard Bachelet et Fils in Chassagne-Montrachet. Their father, Jean-François Bachelet, made wine for most of his professional life at this domain. Following his studies at the Lycée Viticole in Beaune, Marc did internships at Domaines Lucien Muzard in Santenay and Parent in Pommard, as well as stints in the southern Rhône and in Australia. After similar studies, his younger brother Alex did internships at Domaines Nouveau in the Hautes Côtes and Bouzereau in Meursault, as well as at Monteillet in Côte-Rôtie. Both boys worked five harvests at their father’s domain prior to embarking on Bachelet-Monnot.